Another Climate Change Tipping Point: Will Forests Become Carbon Emitters? Warmer temperatures can be devastating for trees. Parasites like beetles, bugs, worms and other insects simply have an everlasting party on the tree trunks due to the warmer weather. The continued bug bonanza causes the trees to die off prematurely and become more flammable in the process. Scientists have been reporting this for some time, yet the extent of the problem appears to be mere guesswork for now. The most obvious plan of action to save forests is to have grad students simply count trees, a practice that has been established for donkeys’ years. But scientists are already warning that as global warming effects are so obviously prevalent in forest deterioration, the past may be no longer the best model to make future predictions. Climate conditions affecting trees at a rapid pace dictate better, more accurate data. The challenge facing researchers is to create effective solutions to the problem of deteriorating forests. The University of Washington’s new method is rather neat. It placed a giant crane in the forest, enabling researchers to count the trees from above the treetops in a gondola. The mammoth task of documenting forest conditions is somewhat more doable because of it. The gondola holds eight people at a time, who’re swung at 285 feet above ground from a jib arm that has a length of 279 feet. Apparently, the height of the crane outpaces each and every tree the researchers have encountered thus far, whilst most of the treetops are within a range of a few yards. The work carried out by the University of Washington’s researchers is top priority in environmental terms. A recent paper by the US Geological Survey published in Science revealed harrowing findings confirming the link between warmer weather and the deterioration of Western American forests. Reason? You guessed it – climate change. Philip van Mantgem, the arborist who led the Geological Survey study, says that the results draw on years of diligent research which mostly involved tree counting by grad students. By doing this tedious work year upon year, the scientists were able to determine a few trends. Most of the existing forest data represents normal, i.e. healthy, forest conditions, and that’s why the University of Washington’s creative idea is so important. 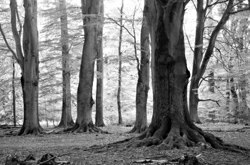 Speeding up and expanding the tree counting will help scientists get a better picture of developments in spontaneously dying forests. While there is controversy and sometimes a lack of clarity when scientists work toward determining specific impacts of climate change on forest health and sustainability, it isn’t hard to understand that dying forests represent a significant danger and threat (also read our recent post about this issue). If new tree growth doesn’t match the rate at which existing trees are dying, there’s a risk that forests will become carbon emitters instead of carbon sinks. Scientists already have a good grasp of the amount of carbon stored in forests, but more needs to be known to understand the overall effects of the interrelated multiple threats to the world’s forests. For instance, Canada’s boreal forest is known to be host to 186 billion tonnes of carbon dioxide. About 80 per cent of the carbon is stored in the soil in the form of compost. The rest is kept in the forest’s evergreen trees, moss and peat. But when it comes to the effects of logging on this forest, the experts are totally unclear. Annually some 900,000 hectares of boreal forest are logged, according to government data, but just how much carbon this removes from the forest is an issue of much controversy. Nevertheless it is of top priority that we get down to the nitty gritty of what’s going on. The warnings are increasingly clear that the link between global warming and forests health is precarious. Greenpeace issued a study last year in which it revealed that Canada’s boreal forest has potential to develop into a ticking “carbon bomb” if logging practices don’t change. The activists warned that logging contributes to the release of significant reserves of greenhouse gases trapped in soil and vegetation. Over time this could lead to a sudden and massive release of greenhouse gases due to a rapid outbreak of forest fires. The Greenpeace researchers, who collaborated with the University of Toronto, estimated the carbon reduction to be 36 million tonnes of above-ground carbon annually. But that was a different estimate than Natural Resources Canada, who believe that most of the carbon somehow stays behind in the forest after the trees are logged. The remainder of the carbon gets transported out of the forest as the logs are taken to the mills. Soil disruption can cause some carbon release, the organization admits, but the experts believe this doesn’t amount to much because of good housekeeping by the forest managers. It’s generally accepted that trees are only temporarily carbon sequesters and that by the time they start to rot, all the nasty material gets transmitted back into the atmosphere again. Arborists stress the importance of not interfering with the natural cycle. A common sense approach to forest management is what is needed. A recent study by a climatologist from the University of Maryland, Ning Zeng, points out that the impact of clearing up dead debris from forest floors would really make sense. Zeng, who scored a hit with his research on the Carbon Balance and Management Journal website, calculated that removing and burying only one sixth of the excess debris can sequester 10 gigatons of carbon annually. Seems like a very good idea. There is an opportunity to get involved and add your voice to the current Oxfam campaign to help reduce global warming by adding support to Oxfam’s climate change campaign. Thanks for the comment and for letting us know about the Oxfam global warming campaign. I’ll see if we can’t get the word out about it more here at GWIR.